Coloured contact lenses have become more and more popular as they become more affordable and accessible. Similarly, many people are also going for the more subtle vision correction method, which is known as the prescription contact lenses. 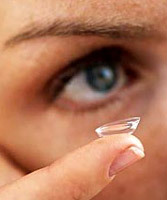 Whether they are coloured or prescribed many brides will wear contact lenses on their wedding day. For all those who wear lenses, itchy eyes, protein build-up and rewetting drops is nothing new. However, here are some tips, which will help you to minimize irritation and keep your eyes healthy. Clean your lenses regularly with saline solution and/or use protein tablets to avoid protein build-up on the lenses. Visit your optometrist at least once a year for routine check-ups. This is important in maintaining good eye health and safe contact lens wear. Wash hands thoroughly before handling your lenses. Put your lenses in before you put on make-up and take them out before taking off your make-up. Handle your contact lenses over a clean towel. If your drop your lenses, they will stay clean and undamaged. Store your lenses in the case made for them and keep the case clean. Do not use cream soaps. They can leave a film on your hands, which can transfer to the lenses. Don`t put contact lenses in your mouth or moisten them with saliva, which are full of bacteria and a potential source of infection. Don`t ever use homemade saline solutions. Improper use of homemade saline solutions has been linked with a potentially blinding condition among soft lens wearers. Never use hand creams or lotions before handling contacts. They can leave a film on your lenses. Don`t use waterproof mascara, which cannot be easily removed with water and may stain soft contact lenses. Do not use hairspray after putting on your contacts. If however you do, then close your eyes and spray. Keep eyes closed for a few seconds after using hair spray.